The exams are nearing soon, and I think I’m spending more time these days dating my books than my girlfriend. Though we understand the incredible need to prioritise Promos, I’m beginning to see my partner less often now and I’m somewhat concerned about us becoming distant in this period. How do you Relationship during exams? As you’ll have noticed by now, as the examination period draws near increasingly our attention will be redirected to booking consultations, rushing out incomplete tutorials, using lecture videos as background music, and deciphering illegible scrawls in obscure corners of notebooks made earlier in the year – the list goes on. The school gradually becomes a pressure cooker and those who have dedicated themselves to a relationship with another person, may bump into additional worries: Are we spending too much time together? Or are we spending too little time on each other? Will we survive the notorious “peak break-up period”? The prospect of ploughing through the past year of content while still keeping in constant contact with one’s significant other poses itself as a tricky balance. Worse still, high stress levels that come with examinations may build greater tension between two individuals, morphing what was once sweet nothings into the yells of fiery quarrels. 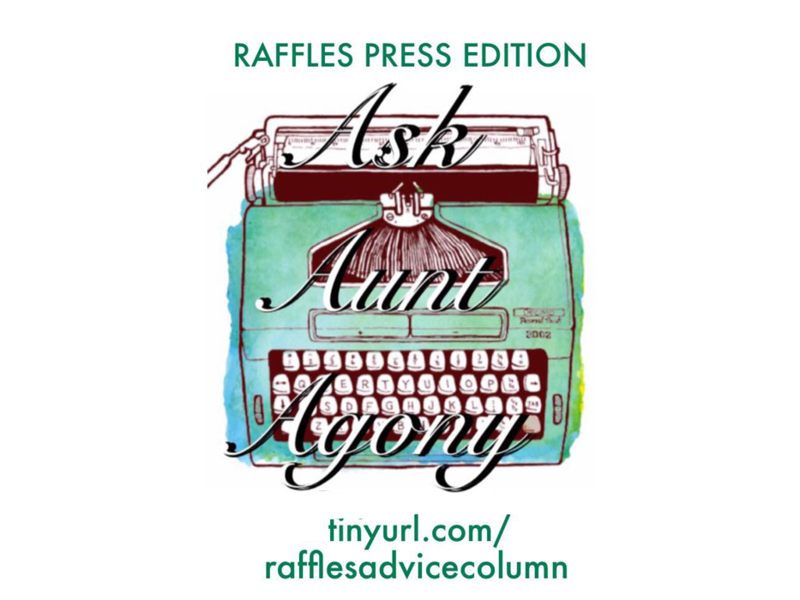 The Aunts and Uncles here at Raffles Press shall adjourn to offer you, and other luckier Rafflesians of your like, some tips to help keep your relationships intact and thriving. The good ol’ study dates return. With the looming horror of examinations, it may be hard to enjoy a good movie or walk in the park. In times like these, the only guilt-free activity may be hitting the books. Yet, trawling through practice papers and stacks of notes alone is no fun task. What better way to spend time with your significant other and get work done than a study date? For once, you’ll need a third wheel. To start, find a conducive study spot which works for the both of you. If sitting together is too distracting, try situating yourselves at separate tables that are still in the same place. Capitalise on each other’s company: remind one another to focus when one of you drifts away from the books. Appreciate any time spent together in the midst of the hectic period, even if it means sacrificing some fun time for the sake of studying. Of course, don’t forget the importance of taking breaks! Be it sharing a dessert or watching videos to reward yourselves, have fun in going through the whole process together. That being said, remember to keep your mind on the books; just because it’s called a study date, doesn’t mean you should study your date! Don’t: Go for a date without the study! Inevitably, lovebirds cannot spend every waking moment together. On occasion, some may burn the midnight oil alone or choose to study with other friends. This separation may bring greater restlessness in the midst of this highly stressful period. Both of you may wish to hang out all the time, but the impending examinations make it difficult. To remedy this, try setting some “ground rules” for the next few weeks. Set aside, for instance, an hour each day where both of you text or Skype. Look forward to this hour every day. Apart from this time, minimize distractions by putting away your phone and any other distractions. Just because you aren’t talking to each other, doesn’t mean you’ve been forgotten! In the long run, the time spent apart may lead to both of you being happier, be it through better grades or a sense of accomplishment from productivity. Whatever it may be, it’s up to you to discover which “rules” help your relationship blossom at a time when studying should be at its peak. When faced with an endless list of questions after days of studying, it may sometimes be difficult to find a peer who is willing to answer them all (but don’t forget that your teachers will always be there for consultations)! We always hear about how peer tutoring enforces your own learning, so this is the best chance to study in an enjoyable way, as a couple! One Twitter user shared the notes her boyfriend made to explain some questions to her. Perhaps such frills may be unnecessary, but be patient with each other, you will get through it together. This may come much easier for class couples or those who take similar subject combinations. Nonetheless, if you disagree on whether biology or physics is the superior science, or you’re an arts-science couple studying almost all possible subjects between the two of you, fear not—there’s probably some Maths or GP to help with! When buried under a ceaseless mound of books, many may feel easily disheartened, tired or upset. This is where a little surprise from the one you care for can go a long way! If you notice that your boyfriend/girlfriend is down, a can of coffee, some flowers or even a short note would be greatly appreciated. Once again, this depends on the nature of your relationship. Even if you aren’t the gift-giving sort of couple, a tangible form of motivation and encouragement in this pre-exam rush can really serve as an incentive to keep going. Some friendly competition between each other can spur you both on. With tension coming from every corner of life, injecting some fun while competing can help make the whole process more bearable. Stress is a known factor to land couples in an argument. So why not convert stress into fun? One way to minimize stress is to have fun together, even when studying. You can do this by placing small wagers between the two of you, getting the loser to treat the winner. For example, you may bet on who would finish all the practice paper questions on dative covalent bonds correctly. This gives the both of you something to anticipate, and make you try your best not to let the other down. By the end of it, not only would you cover a portion of the syllabus, you might have increased bonding between you, gotten a date and improved your chemistry! Of course, many other factors contribute to discord, but for the sake of both of you, it’s necessary to find the balance between academic work and your relationship. Changes may have to be made in terms of your relationship dynamic, but remember to set your priorities straight and make it clear to each other. Every relationship is fundamentally different and it is important to understand each other’s aspirations and needs. Do not have unrealistic expectations of one another, both of you are probably going through a tough time and stressing over work individually. Some of these tips may work better, others not as well, the rest not at all, but the bottom line is to stay committed to your relationship even in the most trying times and remember: communication is key. We advise you then, to motivate each other during this tough time – if nothing else, you can look forward to the post-exam life when you can spend more time together. The Aunts and Uncles here advise that, of course, even if you have your BABES, ideally you should still aim for AAAAAs! And to everyone else, all the best for the upcoming exams!